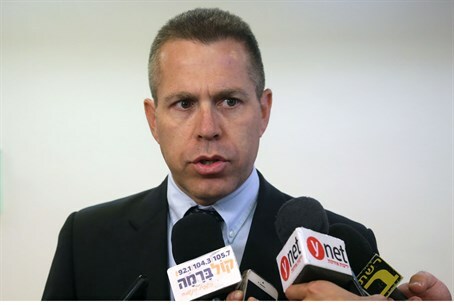 MK Gilad Erdan has made amends with Netanyahu and will be Minister of Internal Security, with a large budget. MK Gilad Erdan (Likud) has made amends with Prime Minister Binyamin Netanyahu and will soon be appointed Minister of Internal Security, with a large budget. The Israel Police will receive hundreds of millions of shekels in addition to its current budget, as part of the agreement between the two. Erdan may also be appointed Minister for Strategic Affairs or Hasbarah (Public Information). Tourism Minister Yariv Levin, who was appointed Minister of Internal Security while Netanyahu negotiated with Erdan, will vacate the ministry and devote himself to the Tourism portfolio. Netanyahu met Erdan last Wednesday in an effort to convince him to join the government and reportedly offered him the Internal Security portfolio together with a sizable increase in the ministry's budget, as well as the Strategic Affairs Ministry. In addition, Netanyahu offered Erdan the title of Vice Prime Minister. Erdan, a popular Likud MK who was Interior Minister and number two in Likud's Knesset list after Netanyahu, officially left the Interior Ministry last Sunday, and turned it over to Minister Silvan Shalom, also of Likud. Netanyahu had offered Erdan the Ministry of Internal Security after the election, but Erdan was not content with the offer. He wanted to stay at the helm of the Interior Ministry and also be named Minister of Internal Security. Netanyahu refused to grant him his wish, and Erdan refused to be sworn in as Internal Security Minister, electing to go back to being a simple Knesset Member for the time being. In the course of last week's ceremony at the Interior Ministry, Erdan said he is considering his next steps. “It's no secret that I wanted to stay in the Ministry of Interior,” he said. “I proposed a unification with the Internal Security Ministry. In both ministries, there are huge challenges. I thought that in the local authorities, along with the emergency organizations and the police, it would be proper for them to be under on ministry, and we could properly deal with matters of emergency, personal nuisance and other offenses.